This article is mistaking an earlier engine that belonged to the San Jose Fire Dept. as far as the purchase by San Jose in 1850, but it does give confirmation on the date Ferndale purchased the Hunneman. San Jose actually purchased the Hunneman in either 1865 or 1866. The photo below is of the sister engine to the one that Ferndale owned. They were both built for and sold originally to the Lowell, MA fire department. This one somehow ended up in Nevada, where it was purchased by a San Jose citizen. We’re not sure what happened to it after that. This photo was found in the archives of the San Jose Historical Museum. 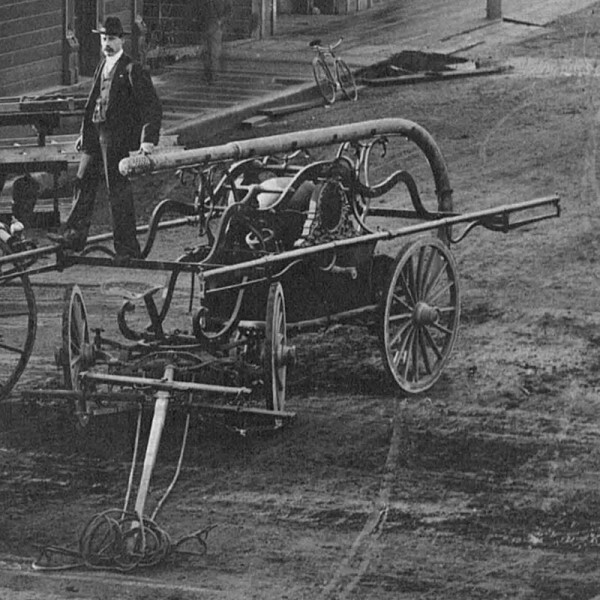 Ferndale purchased this pumper April 14, 1883 and it was the first piece of fire equipment purchased for Ferndale. It is a Hunneman end stroke pumper, meaning the two teams of men manning the brakes (as the pump handles were called back then) would be in front and in back of the engine, rather than on each side as a side stroke engine would work. The handles seen on the side in the photo split in the middle and fold out when in use. The pipe slung up on top is the hard suction that they would use to draft water out of the cisterns that were built under Main St. A large air tank would help reduce the bursts and make a more constant stream. There were two outputs, one on either side, which you can see in the photo. In Ferndale, the engine was pulled by men, not a team of horses. Its purchase pre-dates the Ferndale Volunteer Fire Department. 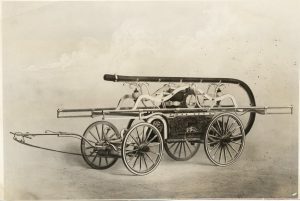 The engine was named the Franklin (as it came from the Franklin Engine Co. of the San Jose Fire Department), and so the first fire department in Ferndale was named the Franklin Fire Department. This early fire department formed, reorganized several times, and then finally disbanded before the current department was formed in 1897. The Hunneman was transferred to the FVFD upon its formation. According to early accounts, this pumper was purchased from the San Jose Fire Department. However that’s where the records get sketchy. 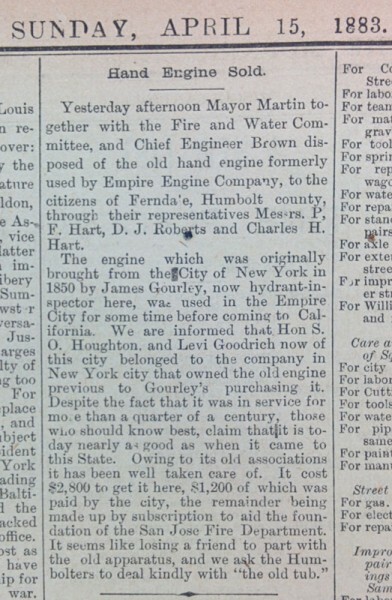 In 1885, the Enterprise reported that the engine that Ferndale purchased had been used in San Jose, San Francisco, and New York. FVFD member Matt Knowles did extensive research on that engine and found it wasn’t a match for the Ferndale engine as it was a James Smith side stroke engine, and the Ferndale Hunneman was an end stroke. San Jose bought two engines in San Francisco, and that New York machine was the first one. The mis-identification of the engine also occured in 1885 when someone in Ferndale saw a story in the San Jose paper about their engine and assumed it was the one that Ferndale purchased. Unfortunately, that story got passed down, first in Denis Ederline’s book, and then also in Where the Ferns Grew Tall. Also in the first edition of Where the Ferns Grew Tall, there is a picture of a Hunneman pumper, however, it is not the machine that Ferndale has. Somehow they included a photo of the Hunneman that Columbia has. These three companies (Eureka, Empire & Torrents) constituted the fire department of San Jose for many years, and this apparatus, with the addition of a new hose and a hose cart or two, comprised all the apparatus until 1865, when the present steam engine used by Empire Company was purchased by the city. This of course cause the old engine used by Torrent Company to present a very insignificant appearance, and the boys cast about for a better machine. Mr. Gourley went to San Francisco, where he found a beautiful Hunneman hand engine for sale very cheap. He spent some time in testing its capacity, and, being fully satisfied, came back and reported to the company. Application was made for its purchase. The price was $1,700 cash, and the city only had $1,250 available for this purchase. The council finally agreed that if the balance could be collected by subscription, they would buy the the engine. A meeting of the company was called and the proposition presented. There was a good deal of discussion, the tenor of which was that it was useless to attempt to raise so large an amount. Finally Gourley threw $50 on the table, saying that it was about the last dollar he had, but it should go towards purchasing the new machine. Immediately the coin began to be poured on the table, and in less than twenty minutes the whole amount was raised. The machine was purchased and remained with the company until 1873, when the city purchased a Clapp & Jones steamer for the Torrents, and the old Hunneman was turned over to Franklin Company, which had lately been organized. A few years later it was sold to the town of Turlock, where it is still doing good service. Everything seems to fit, except for the last line, that it was sold to Turlock. According to Turlock Fire Department’s web site, they bought their first pumper in 1908 and it wasn’t a Hunneman. But the engine that Ferndale had was variously described as being named “Torrent” or “Franklin”, and those are the two San Jose fire companies that it passed through. The purchase and sale timeframes are about right too. There is a record of Hunneman #674 being sold to the dealer in San Francisco in 1864, but there is no record of who eventually bought that engine. However, other research shows the Hunneman that the Franklin Co. in San Jose had came from Lowell, Mass. When that engine was researched, it went from Lowell to another fire department on the east coast. So it’s been very difficult finding an engine that can make all the various stories match up. We’re still trying to get more information from the San Jose Fire Museum on the Hunneman they owned. They do have a digital copy of the Franklin Company log book from that period and if we can obtain a copy of that maybe it will provide some clues.